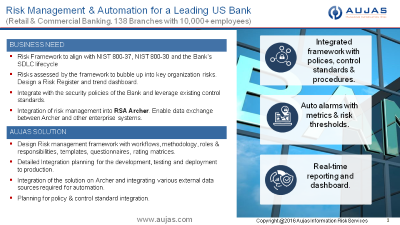 Aujas was engaged by a leading bank in US with retail as well as commercial operations for creating a risk management framework and its automation. Aujas started by conducting a detailed strategic planning and solution design initiative to identify quick wins and to establish the long term roadmap for managing access risk. The entity was formed by coming together of a major retail bank in US with the US operations of a large Japanese bank. Over 138 branches with more than10,000 employees and over 1,200 applications supporting core business functions added to the complexity and scale.